* The Above Video is an Injury Reconstruction Animation Benson & Bingham had Produced for a Client Case. Big Rig accidents are very common in Las Vegas due to the tremendous growth, which not only increases the volume of construction vehicles that traverse the roads, but also transport and moving trucks. Dump trucks, garbage trucks, concrete trucks, buses, dirt haulers, cranes, and other 18-wheelers cause devastating damage when they collide with pedestrians or cars. 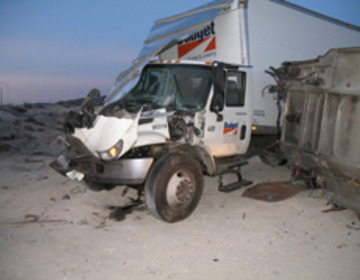 Commercial vehicles often are rented or leased which can present legal challenges to the victims of such accidents. Benson and Bingham has litigation against all the major quasi-governmental agencies and public transportation entities like CAT Bus or ATC/VANCOM which runs the local public buses, or LAIDLAW transit which operates other trucks. REPUBLIC SERVICES, who runs the garbage trucks, have a history of being sued in Las Vegas for horrific damage cases. As a law firm that specializes in 18-wheeler or semi accidents, we will assist in all aspects of recovery from property damage to medical care. Fatal accidents are extremely common with rigs due to the weight, especially when fully loaded. When these rigs collide with much smaller vehicles you get an unfair advantage in kinetic energy. Kinetic energy is a formula for calculating mass and speed to arrive at an energy rating. The mass of 18-wheelers and big rigs is so large that even small speeds can cause devastating injuries and fatalities. The kinetic energy of a rig accident is so great it is equal to the energy of 17 cars colliding. For example, the typical weight of a rig can exceed 60,000 lbs. A typical automobile weighs only 3,500 lbs. When the mass is multiplied by the acceleration or speed the obvious energy difference is apparent. Emergency vehicles while operating with their emergency lights often cannot arrive fast enough for injured victims of a motor vehicle accident. However, for those parties not involved in an accident, those speeding vehicles pose a great danger. Police officers in a felony pursuit often travel at speeds well in excess of the posted speed limit. While emergency vehicles are governed by Nevada Revised Statutes and serve an important service, Police Officers, Paramedics and Firefighters can operate their vehicles negligently causing auto accidents. Private party vehicles may not always yield or give way to emergency vehicles due to other distractions (cell phones, radio, communication with passengers) thus causing a car wreck. If you have been involved in a motor vehicle accident involving an emergency vehicle or public transportation authority, choose a law firm that understands your rights. Benson & Bingham is a full service law firm that solely practices personal injury, and our team is dedicated to helping clients every step of the way. Contact Benson & Bingham today for a free consultation. "Ben was amazing. He actually came out to see the injuries himself. I dealt with him directly at all times. When I first got my settlement, he made sure that I wasn't just gonna go blow it. First thing I did I invested it into our business. We have a new life now. Thank you Ben. "